Markets went higher last week and ended the lunar green period with a nice 267 point gain for Nasdaq. 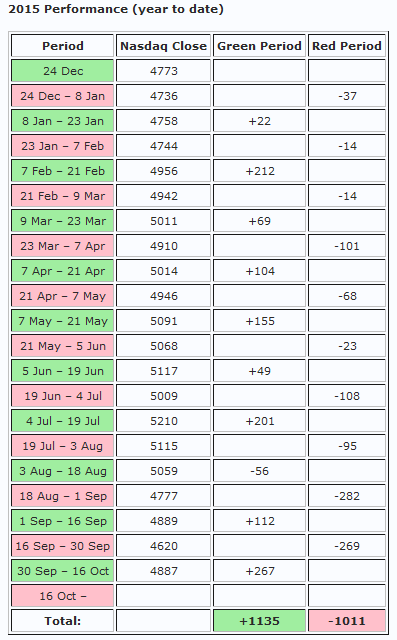 So far this year the lunar cycle has been ridiculously accurate in calling the swings in the market. There are still a few more months to go and a lot can happen, but this could easily become the best year for lunar cycle trading since 1950. The previous top years were 1998 and 1956, when the green periods outperformed the red periods by 34% (for S&P 500). I am saying this to warn readers that this streak WILL end and the lunar cycle will go back to more “normal” performance sooner or later. And there will also be bad years. E.g. the worst year since 1950 was 1987, when the market lost 19% in green periods and gained 16% in red periods. And almost equally bad was 1990, when the S&P 500 lost 18% in green periods and gained 25% in red periods. This gives you some idea what to expect when a really bad year comes around. I am getting more questions about the lunar cycles than ever, and new followers on Twitter every day. That’s all very nice, but this suggests that too many people are starting to keep an eye on the moon because it has been doing well all year. Don’t become too confident in the lunar green and red periods. Historically they “work” 60% of the time, not 90% of the time. The Nasdaq is coming into overhead resistance in the 4900-5000 zone. The Earl indicator (blue line) has turned down, while the slower Earl2 (orange line) and MoM indicator are still headed higher. This suggests there could be a bit of upside left, but we could as easily have some short term top at hand and head into a phase of consolidation. I think 4700-4950 is going to be the range for a while. 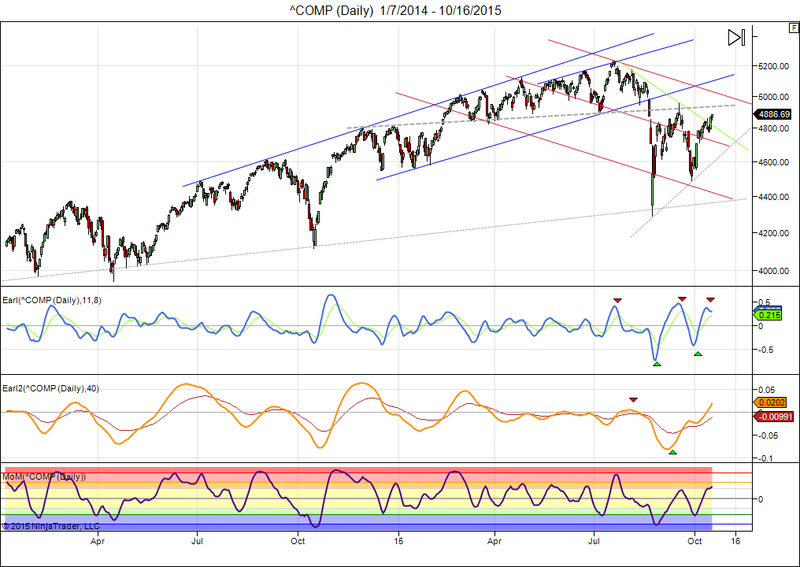 A drop below 4700 would not look good and a painless climb to 5000+ would probably be most surprising for investors. This entry was posted on October 19, 2015 at 1:32 pm	and is filed under Financial Astrology, Market Commentary. Tagged: lunar cycle, performance. You can follow any responses to this entry through the RSS 2.0 feed. You can leave a response, or trackback from your own site. Didn’t expected S&P to cross 2044, as it failed to cross three time in this month and today banged it to 2055! what are the next levels for S&P for resistance? I have position in SPXS at 18.72 and UVXY at 28 ! You think we can get 2020 by 29th September considering the fed event on 28th? I think you ask for 29th October (not Sep) => Everything is possible, also 2020. But I don’t know what will happen today or tomorrow. I think the odds that market will push higher have gone up significantly with yesterday’s close at 2052. If this has trapped enough investors who were hoping for another drop then the S&P will probably not look back. It will become more clear today or by early next week. Yeah, I meant October! Sorry for the typo*. I saw your post for $SKEW and believe it or not, even 2500 on S&P is possible by March 2016 as it has similar chances of going up around 30%! And their by your dow theory of 32000 by March 2017 will also remain intact! I have to admit, though knowing all these things, its still hard to make money! The Naked truth of market! :) Thanks for the feedback. I had a feeling that by 13th october it should make a top and then should correct, so initiated short trades but didnt worked out! Looks like this red lunar month will give positive return! which indicated positive trend change i.e. upwards…if i am not mistaken! Danny have you ever back tested a lunar Green/Red system using Proshares SSO/SDS etfs or some other etfs or stocks? That would be interesting to see the results. With leveraged etf you can of course boost the results. Backtesting with different indexes will not lead to hugely different outcomes (other than the effects of leverage) because most markets have a high correlation with Nasdaq and S&P 500. Sector indexes are a different story. Some sectors , e.g. gold and reits, move different from the overall market and sometimes become the recipient of “flight to safety” when the overal market is going down.